Showing results for tags 'grove'. GROVE Welcome to the Southside Grove Street Syndicate, or for short, Grove. We're a crime-based group in the south-side of the city, centering around Grove Street. Our history is long and thorough, we've been here as long as the city has been around. The gang is held together with a strong sense of brotherhood, all our members are considered family and neighbors. An important part of the Grove gang is to live in and represent the south side of the city, although we dominate the entire city, the South will always be our territory. Grove specializes in small-time crime (mugging, pushing, killing). We are a street gang through and through, but we follow the money, and whichever route is most profitable. First Grove meeting, very stable gameplay. 2018 & RageMP There's a lot more to come for this thread, and Grove is currently undergoing a revival for 2018 and the release of RageMP. Going forward we'll be looking for new members as well as high ranking members. If you'd like to join us, please join our Discord channel and follow the instructions presented. We prefer to recruit people in-game through roleplay, but the Discord can be useful for checking when recruiting members are online. Feel free to ask any Grove related questions in this thread or in the discord. CLICK HERE TO JOIN THE DISCORD. 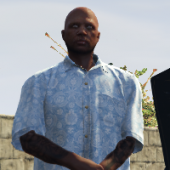 Isaac Cuirly (Head of Grove), on Grove Street representing.